Last fall, from October 30 until November 8, 2013, The World Council of Churches (WCC) held its every 7-years global assembly in Busan on the southern tip of the mainland of Korea. With the theme of “God of Life, lead us to Justice and Peace”, it was perfectly suited for Gangjeong, and activists and villagers from Gangjeong, as well as nationwide and international supporters attended the assembly, hosting both a workshop on Inter-Island Solidarity and an Exhibition Booth about Gangjeong’s struggle. At the time, Gangjeong’s struggle was also brought before the assembly as an issue to be discussed in the official statements released each time by the WCC. The public issues committee and the WCC delegates which had the delegated authority to choose which issues would appear in official statements, voted to choose Gangjeong. Gangjeong and its supporters were overjoyed, however due to unresolved issues, there was not time to finish and release the official statement by the end of the assembly and it was pushed back to July 2014 when the WCC central committee would meet again to resolve remaining issues. […] 8. 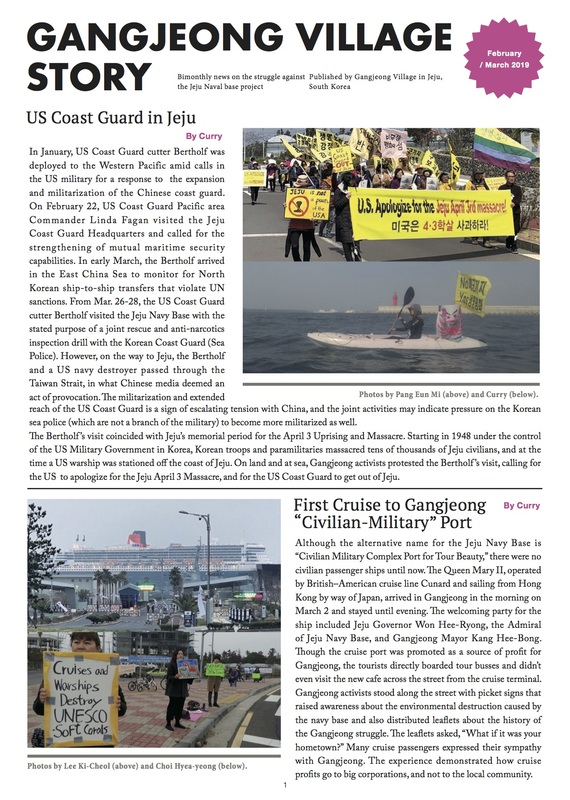 Oppose the expansion of military bases, nuclear forces and missile defences in Asia or targeting Asia, and raise aware­ness of public resistance to such military expansion including the new naval base at Gangjeong Village on Jeju Island, Republic of Korea. According to the WCC, they represent over 500 million Christians in more than 110 countries, making them one of the worlds largest religious councils. This clear mandate for its member churches, ministries and networks to oppose the Gangjeong naval base is a major win for the Gangjeong struggle! Please spread this great news around and encourage those you know in WCC related churches, networks and ministries, to join in this new mandate of the WCC!